Fans of the unique performance of the 24 Festive Drums will be delighted that the third International Invitation & National Competition of the 24 Festive Drums will be held on August 2 at the Educity Sports Complex in Nusajaya. In the second edition of the event in 2012, the troop from SMJK Yu Hua Kajang swept up the prizes in all categories and triumphed as the national champion of the 24 Festive Drums competition. This year, 10 troops representing states in East and West Malaysia will compete for the national title while 6 troops from UK, USA, China and Singapore will present guest performances. 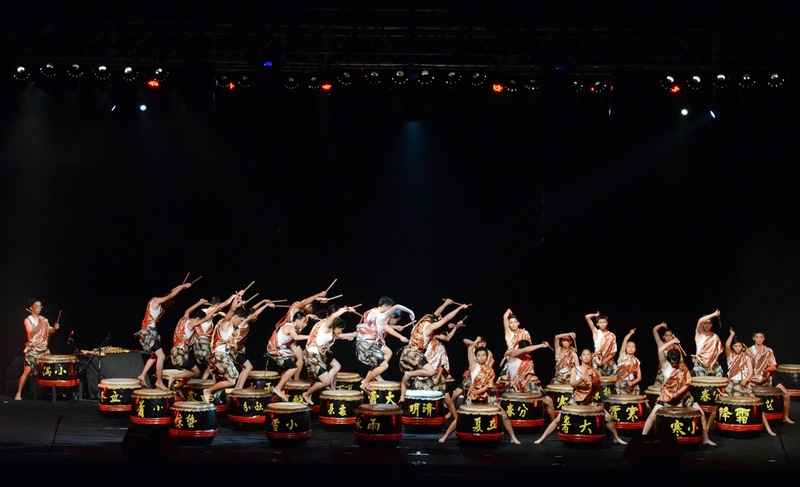 In 1988, when Tan Chai Puan and the late Tan Hooi Song founded the Festive Drums in Johor Baru, they did not know that this spectacular art of drumming would grow into an international art-form. 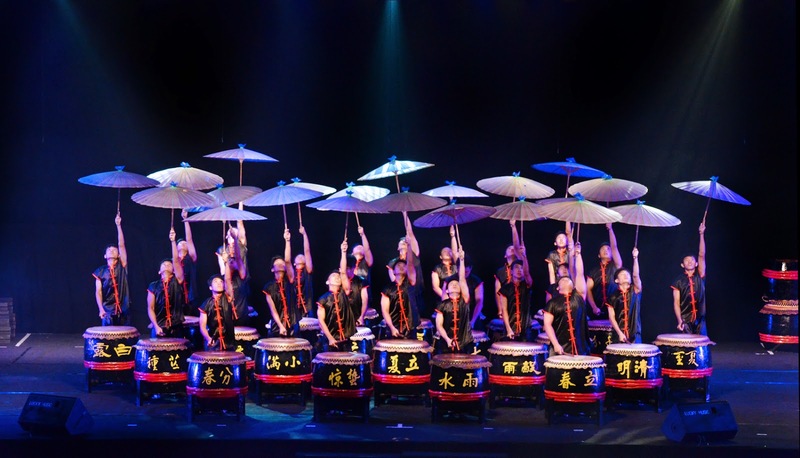 Since its inception at Johor Baru’s Foon Yew High School, this unique art of drumming has spread nationwide and abroad and now there are more than 300 drum troops worldwide including professional troops in Singapore, Taiwan, China, Thailand, Switzerland, United Kingdom and the United States. The 24 Festive Drums celebrated its 26th anniversary June 12 this year and is proud that this art of drumming was recognised as a national cultural heritage by the Unity, Culture, Arts and Heritage Ministry on 14 February 2009. 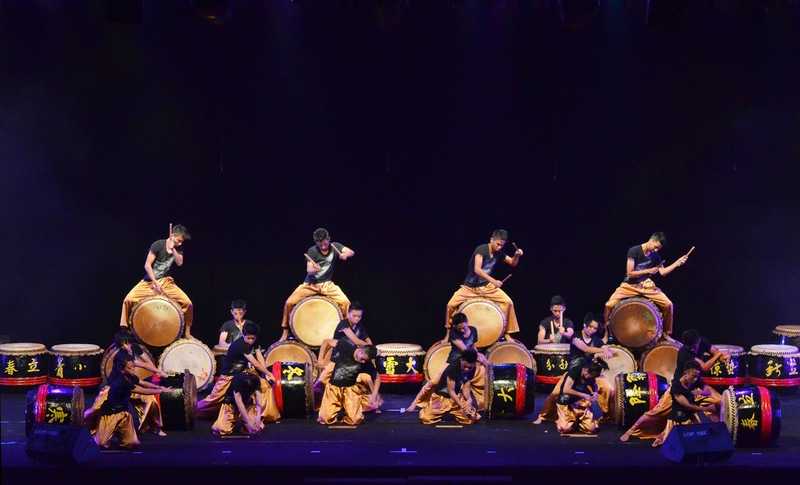 While the drums are a cultural element from China, this performing art is truly a Malaysian heritage as the 24 Festive Drums was born in Johor Baru and has gone global. For its future development and to keep this art form viable, Tan said that drum troops will need corporate sponsorship. He also said that a Coach Training Programme will be established to guide drummers with a standard syllabus and this would be monitored by a professional committee and supported by the Ministry of Education. “As JB is gaining a global reputation, I’m proud to see that the 24 Festive Drums is becoming an attraction that is as interesting as JB’s annual Chingay parade,” said President of the Tiong Hua Association, Dato Sri Tey Kim Chai. “Hosting the International Invitation & National Competition of the 24 Festive Drums in JB will also bring in revenue for the local community” he added. It is interesting that this art form was exported back to China when the Foon Yew High School troop proudly performed the Malaysian 24 Festive Drums at Teochew City, China, on their first visit there in 2008. In the same year, Malaysian students in Oklahoma State University started the first 24 Festive Drums troop in the United States and were proud that their drum troop had the privilege to perform at half-time for the NBA games in Oklahoma City in 2010. Since 2008 when drumming was included in the primary 6 school syllabus, drum troops have been established in primary and secondary schools in East and West Malaysia and even among the physically handicapped. Fans of the festive drums can look forward to a spectacular show featuring colourful and creative drum performances by Malaysian troops and foreign troops including the troops from the Oklahoma State University, USA, the University of Liverpool troop, UK, Hua Qiao University, China, Teochew Qinglong Ancient Temple, China and ZingO Festival Drum Group from Singapore. Competing troops stand to win cash prizes, certificates of participation and the champion will take home the challenge trophy sponsored by Tan Sri Dato’ Low Nam Hui. With a smaller venue this year, tickets are limited and are available in categories priced at RM100, RM60, RM40 and RM20. Ticket purchase also entitles photography enthusiasts to take part in a photography contest. Break your fast with a difference this year at the Grand Gem restaurant and enjoy a buffet spread of North and South Indian specialties prepared by chefs who are hand-picked from Kolkata, Uttar Pradesh and Tamil Nadu. The Grand Gem, located within the Grand Bluewave Hotel Johor Baru, has been pleasing connoisseurs of Indian cuisine and gaining a loyal clientele who are coming back regularly for this authentic taste. This Ramadan you can savour a daily changing menu of dishes with soup, appetizers, salads, bread, rice, vegetarian and non-vegetarian dishes and desserts on a culinary journey into another realm where aromas, colours and flavours come alive! If you like to break your fast sweetly, select from the dessert buffet of Indian and local sweets in a menu of traditional Rava Kesari, a popular South Indian dessert made from semolina, local cakes or kueh, ladoo, gulab jamum, jelly and of course, juicy dates and fresh fruits. For a change, try the ladoo, ball-shaped South Indian sweets made from wheat flour and sugar and gulab jamun, spongy milky balls soaked in rose scented syrup. Look out for kheer (North Indian name) or payasam (South Indian name), a creamy rice pudding usually made with wheat or vermicelli, milk and sugar and flavoured with cardamom, raisins, cashew nuts, pistachios and almonds. After you have sweetened your palate, warm your stomach with a little soup. The choice of soup at the Grand Gem changes daily so you may savour popular choices like spicy chicken rasam, mutton soup and mild chicken sweet-corn soup. Nibble on crispy Masala Papadum dipped in mint sauce to whet your appetite and start with plump rings of Chicken Vadai and other Starter items like crispy Chicken-65, Onion Pakoda, Vegetable Pakoda, chicken wings, vegetable spring rolls and Malabar fried fish in various daily menus. You will have choices of North and South Indian breads like roti canai, pudina paratha, garlic and butter naan, kulcha, rotti and idiyappam (string hoppers) to eat with the gravies. Besides the daily serving of Briyani Rice, there are also popular local fried rice and noodles like nasi goreng kampong, mee goreng mamak, nasi goreng and mee goreng as well as satay – grilled skewers of chicken or mutton with spicy peanut sauce dip. Their rotating buffet menus even include fried meehoon (vermicelli) and kway teow (flat rice noodles). One of the exciting experiences at this Ramadan buffet must be the live-cooking station where chefs will make and serve piping hot Romalli Roti. It’s interesting that the bread will be cooked over the saline covered underside of a heated wok. Then watch as the chefs skillfully spin the dough in the air before swinging them down to cook on the heated wok and deftly fold the Romalli Roti into squares for you to savour with delicious gravies! The Grand Gem Ramadan buffet offers a range of vegetable dishes like Aloo Channa, cauliflower Manchurian, vegetables Szechuan, Bhindi Pitley and Kumbli Broccoli Delite, a delightful dish of broccoli and mushrooms cooked with kadai masala and cashew nuts, to meet the tastes of vegetarian diners. Besides fresh vegetable salads, freshly prepared Pav Baji vegetarian burgers, made with toasted buns filled with potato and tomato patties, are also served. Depending on the daily menu, the chefs at the live-cooking station will also make fresh mini murtabak, roti jala and even kueh dadar dessert! Non-vegetarian diners can pick from rich gravies like Chicken Noorjahani, Mutton Dalcha, Bhuna Gosh (mutton), Kanavai (squid) Perattal, Prawn Vindaloo, Mutton Rogan Josh and chicken Rendang as well as the mixed grill platter. These traditional roasted items include tender murgh (chicken) pudina, tandoori chicken, murgh badami and minced lamb seekh kebab. The buffet comes with free flow of chilled cordial drinks and you can end with hot coffee or tea. Break your fast this Ramadan at Harbour Café, Traders Hotel Puteri Harbour with family and friends over a sumptuous meal that’s reminiscent of home. The chefs and their culinary teams at the Café have put together a buffet spread of 60 delectable dishes daily in 6 different menus that will be rotated throughout the month of Ramadan. The breaking-of-fast buffets here will feature traditional favourites and home-style cooking designed in the tradition of family get-togethers. Break your fast traditionally with a selection of juicy dates and thirst-quenching drinks and then warm your stomach with the wholesome richness of Bubur Lambuk or rice porridge. Then choose from a range of traditional appetizers like Sotong Kerabu (squid salad), Rojak Buah (fruit salad), Jeruk Mangga (pickled mango) and Chef Alan’s Special Vegetable Achar. Executive Chef Alan said this vegetable pickle recipe, made with cucumber, turnip, carrot and cabbage tossed in crushed peanuts and sesame seeds, was inspired by his grandmother who used to make this delicious dish. Fresh garden salad and cold cuts are among the range of western appetizers you can enjoy before moving to the main course items. Chef Alan is making use of local strawberries from Cameron Highlands to create a light fruity sambal which he will use to bake with fresh whole salmon. He has prepared up to three whole fish for each serving, so there will be enough for everyone to choose their favourite parts and savour this uniquely flavoured fish to your satisfaction. “Just as in family-style dining, our lamb shanks are served whole for diners to share among family and friends,” said Chef Alan about the Singapore style Sup Gearbox which is braised for up to 4 hours in tomato-based thick gravy. “These tender lamb shanks will be served warm from a giant kwali or wok and the best way to enjoy them is to eat with your fingers and dig in for its bone marrow,” he added. More main course dishes like roasted whole Lamb Kuzi, Udang Gulai Nenas (prawns), Siput Lemak (shellfish), Ikan Bakar (grilled fish) and Ayam Percik Utara (chicken) go well with a choice of Nasi Pelangi (Rainbow Rice) and piping hot steamed white rice. While Ayam Percik Utara is popular in the East Coast, Harbour Cafe is serving it here to meet the tastes of diners from the North who want a taste of home. These are created with skewers of chicken marinated in a creamy sauce and grilled to perfection in the tandoor oven. A taste of home is not complete without traditional condiments like a range of ulam (local salad), serunding (dried meat floss), tempoyak (fermented durian) and sambal belacan (spicy shrimp dip). Live-cooking stations will be serving perennial local Malaysian favourites including roti canai and murtabak, dim sum and chee cheong fun, as well as sticks of grilled beef and chicken satay served with spicy peanut sauce and its condiments. If you prefer some noodles, there are also choices of chicken noodle soup, Mee Bandung and Curry Laksa in the daily spread. End your meal sweetly by watching the serving staff skillfully pull Teh Tarik or pulled tea and serve it with a frothy head. Pick a choice of hot beverages and savour it with sweet treats like cubes of Supreme Durian Tempura that are crispy on the outside and creamy on the inside. You can look forward to an assortment of local kueh (cakes) and desserts like Bubur Cha-Cha as well as jellies, tarts, cakes, crumbles, mousses and ice-creams for a sweet ending. Indulge in delectable cubes of Supreme Durian Tempura that are crispy on the outside and creamy on the inside! I received a giant cookie when I checked-in! I’m counting and it’s been 37 years since I lived in Jalan Ngee Heng with our grandparents in our home at No.154. We made many memories in this friendly neighbourhood but it was a sad day for us when Ah Kong or grandfather received a letter from the government advising him to vacate the house because the land was being acquired to build the highway. I remember being part of the team along with my mum, aunts and grandma, who had the challenge to pack away everything in that double-storey bungalow and shift out after living there for about 50 years. In 1977 Ah Kong’s house with an adjacent badminton court was demolished and the site became part of Jalan Tun Abdul Razak. What remains of our grandfather’s house today is a tiny wedge of land situated directly opposite the Wisma Maria Medical Specialists Centre. Part of this bit of land is occupied by an advertising pylon while an enterprising hawker has claimed our former driveway for his business! I’m glad the row of double-storey shops next to Ah Kong’s former house still remain and its original architecture still preserved. I remember how we used to patronize the two family-run Chinese provision shops and were friendly with the operators of Indian laundries, a coffee shop, a tinsmith and the families and tenants who lived upstairs. These buildings are now renovated for new businesses like restaurants, specialist clinics and medical laboratories and with DoubleTree by Hilton Johor Baru open for business now, they are poised to bring new life to this old road. In April, I had the privilege of a sneak peek into the DoubleTree by Hilton JB hotel (Reinventing dear Jalan Ngee Heng, NST Streets Johor dated April 22) and I saw workers installing fixtures and putting finishing touches to the décor. Suppliers delivered furniture and workers were tinkering away as I walked through the ground floor restaurants and I also saw the Level 13 restaurant and swimming pool. I was simply exhilarated and amazed as I never imagined that an international brand hotel will be opened at No. 12, Jalan Ngee Heng and with all the work going on, I could imagine the elegance when they welcomed guests into their stunning hotel. On May 30 I was pleasantly surprised to receive an invitation from the hotel to go for a trial stay and all I had to do was to confirm my check-in date. As I replied with my preferred dates, I’m aware of what was involved in a trial stay and mentally prepared myself for the experience. But most of all, I was just thrilled that I was going to stay in Jalan Ngee Heng again! Guests at the DoubleTree by Hilton JB enjoy a parking privilege in the basement car-park so I drove along the one-way street down Jalan Gereja around Menara Landmark to reach the hotel porch to turn into the car-park. I like the freshly-painted, brightly-lit basement car-park that has spacious driveways and wide parking lots. Following the signs, it was easy to find my way to the hotel lobby and on checking-in I was presented with my room keys along with DoubleTree’s signature giant chocolate chip cookie! The cookie-with-check-in is a delightful DoubleTree by Hilton gesture to welcome guests and I could not wait to taste it as it felt warm and heavy in my hand. As soon as the bell staff dropped my bags and left the room, I reached for my cookie and started to munch on it while I inspected the room facilities. One bite led to the next and I almost finished the 0.056 kg (almost 2 ounces) cookie filled with generous sprinkles of melting chocolate buttons and chopped nuts before I remembered and stopped to take a photo of it! Members of Hilton HHonors guest loyalty programme, invited guests and representatives from the media like me, thronged the hotel for an experience before it opened on July 1. We sampled a wide range of local cuisine served from live cooking stations and buffet spreads in the Makan Kitchen and savoured snacks, sandwiches, salads and pastries with brewed beverages at the Food Store. Refreshing drinks were enjoyed at Axis Lounge in the lobby and by night, the charming ambience at the Level 13 poolside was the preferred place to chill out after dinner. My stay was not a laze-and-eat time but I was tasked with the responsibility to use the hotel facilities and experience the outlets to give constructive feedback in forms provided. The hotel is committed to their hospitality brand and takes a serious view of my comments after I had sampled food and interacted with staff for my experience of food quality, facilities and service standards. While hiccups are expected in pre-opening operations, I’m glad that everything is being done to give guests a special experience at the first DoubleTree by Hilton hotel in Johor. When I snuggled down to sleep, the bed was oh so comfortable but their pillows were just too soft for me. The Housekeeping Department was still in the process of preparing a menu of pillows so I made do with my usual modification of adding a layer of fluffy towels to my stack of soft pillows. The sun was peeping in from the edges of drawn curtains when I woke up and I was shocked to see the time because I had slept so soundly but it felt so good to wake up in Jalan Ngee Heng again, just as I did 37 years ago. Allan Fraude cooks in the dark! When a friend told me about Allan Fraude, the star of a 13-episode TV series “Cooking in the Dark,” I was keen to share his story because Fraude is blind and he cooks. With the right attitude, Fraude, 53, has overcome obstacles with sheer determination and I believe his passion for cooking will inspire others who may be going through challenges in life. So I made arrangements to visit him and experience his culinary skills. It was a reunion of sorts when I invited myself over for lunch because way back in the 1950s, my parents and Fraude’s mother used to work together in the Johor Baru General Hospital (now known as Hospital Sultanah Aminah). familiar space. That’s because his wife, Wong Man Chen, has organised their kitchen in such a way that Fraude knows where everything is and can reach for items quite conveniently. The twin sinks, narrow draining board area as well as the four-stove gas cooker are his domain when he takes over the kitchen to cook seven dishes for our lunch. The affable Fraude kept up a lively banter as he worked and he did not hesitate to apologise for his small kitchen and how he always works up a sweat while cooking. I assured him that it’s all right because perspiration is all part of the exercise and that I will let him freshen up after cooking with enough time to powder his nose before the photography session. Throughout this time, Fraude was moving around the kitchen between the sink, stove and refrigerator and I was careful to dodge out of his way as he moved with confidence in his familiar work space. Fraude, the sixth in a family with five older sisters and one younger brother, was not born blind but gradually lost his sight in 1990 due to glaucoma. His late father, Kalliff Paul Fraude, a Eurasian of Scottish and Thai descent was born in Ipoh and came to Johor to work as a Field Conductor with the Kulai Palm Oil Estate. His Thai grandmother used to prepare spicy dishes in Thai recipes and as his father acquired a very spicy taste, Fraude and his siblings also got used to the fiery flavours of their unique Thai-Eurasian recipes. Fraude recalls how he used to help his grandmother buy ingredients for her recipes and this was probably what sparked his interest in cooking and the reason for his personal taste of extremely hot spicy flavours! Chili padi – the small firecracker chili peppers – features greatly in the recipes that were handed down through his Thai grandmother to his father. Fraude said that his father had a few favourites like Devil Curry, fried kway teow and fried rice that he often cooked for the family, always laced with a generous dash of chili padi. He fondly remembers how irresistible his father’s Devil Curry was because no matter how spicy it tasted, they would bear the heat to eat it. They were probably trained for it because since he and his siblings were about 2 or 3 years old his mother would pick the potatoes from the spicy Devil Curry and rinse them out in water for them to eat! In the estate, they lived in a bungalow and had a carefree childhood, roaming the estate and mixing freely with Malay and Indian neighbours. Fraude said they discovered the pleasure of eating traditional Malay and Indian food and were exposed to various cuisine and cultures especially during their festive seasons. One of the images he remembers well from his childhood is how his mother would grind her own chili paste manually using a batu giling or grinding stone, to cook her famous curry and other spicy dishes. She is Chinese Teochew and between her Chinese recipes and his father’s Eurasian dishes, they created some unique family favourites, the most popular being a form of Roti John they fondly call Roti Babi because it is a sandwich filled with minced pork, dipped in egg batter before being fried and then savoured with a special spicy dip sauce. In those days, travelling traders would set up a small pasar malam or night market in the estate on pay days to sell food and clothes. Fraude said this was a much anticipated month-end treat for the family because his father often bought them satay and ketupat from a vendor. He said they seldom ate out and the only times they could savour meals in restaurants was when they were invited to relatives’ wedding banquets. Even after tasting a wide variety of food, the fond memories of all the good food that his parents used to cook are an inspiration for him to replicate them. His wife, Man Chen, was a former schoolmate who became his sweetheart and they were married in 1989. For 10 years Fraude was a Frontline Staff with a bank in Kulaijaya and over the years, he often experienced high eye pressure and was later diagnosed with glaucoma. He did not realise that optic nerve damage was gradually developing in his eyes and his vision was slowly deteriorating. Man Chen recalls the horror of being called to the bank one day for an emergency when Fraude was suddenly bleeding from his left eye. She rushed him to the hospital but after treatment, the permanent damage to the optic nerves resulted in his gradual loss of sight in his left eye. Man Chen will never forget that night in 1990 when she was pregnant at full-term and her water suddenly broke. She said it was a miracle that Fraude managed to drive her safely to the hospital in Johor Baru at about 2am when there was less than 10% vision left in his right eye! Fraude’s glaucoma degenerated rapidly and when their daughter, Rebecca, was just two months old, he became blind. With such a disability, he could no long work with the bank and had to be rehabilitated to acquire new skills. In 1993, Fraude joined the Gurney Training Centre in Kuala Lumpur where he learnt to read Braille and other skills to live with his disability. Even though Fraude took a training course in massage therapy, he did not pursue it as a career. Man Chen became the sole breadwinner of the family and as she hardly had time to cook, they usually had their meals in the homes of Fraude’s mother and his mother-in-law or they would eat at nearby restaurants. At one point, they decided to order catered food for its convenience but it was not long before they got tired of the menu and cancelled the order. In her advancing age, his mother seldom cooked and as Fraude started to miss her food, he decided to try cooking their family recipes. It was a turning point for Fraude when he made up his mind to be useful in the kitchen to provide meals as memorable as what he experienced in his own childhood. If he was unsure of the recipes, he would phone his mother to ask her about ingredients and how to prepare certain dishes. He realised that if he did not learn how to cook those familiar favourites, he may never taste them again because even his sisters did not master their family’s recipes. 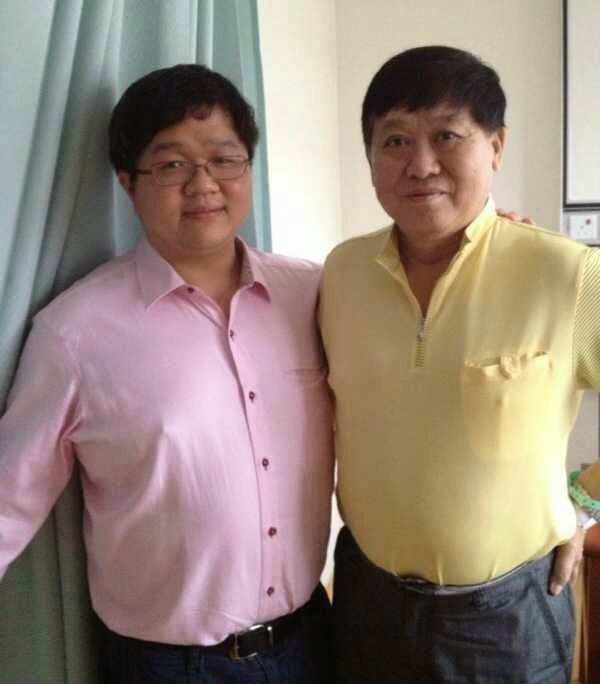 “My wife and daughter were my guinea pigs,” said Fraude with a chuckle as Man Chen smiled in agreement. Her courage in supporting his culinary pursuits reaped a mutual benefit because Fraude gained a new confidence as he successfully whipped up many family recipes not only to his own satisfaction but to the delight of family and friends who enjoy his delicious dishes. Fraude’s new-found confidence in cooking caught the attention of his niece, Sonia Chall, who was so impressed that she introduced him to a local production company, Crooked Mirror Productions. The producer cast him as the star of their 13-episode TV series “Cooking in the Dark” where the blind cook shares the secrets of his family recipes. In the 30-minute programme hosted by Malaysian TV personality, Jay Menon, Fraude demonstrates his unique ability to cook in the dark as he kept up a lively banter with her. This TV series aims to inspire the disabled with Fraude’s “can-do” spirit and uses cooking as a life analogy to show how we can overcome any obstacles in life with determination and a positive attitude. He recalls his exciting experience during the filming in Kuala Lumpur and the challenges of cooking in an unfamiliar kitchen but agreed that it was great fun to whip up more than 20 of his family’s recipes for the series. Besides his father’s recipe for Devil Curry, Fraude also made local favourites like popiah, nasi lemak, petai sambal as well as Indian fish curry. 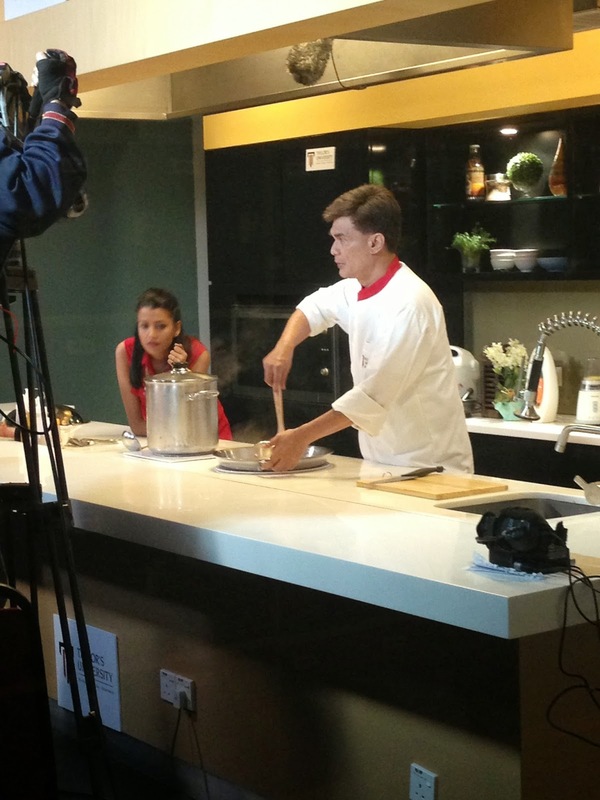 While the TV series is in post production and waiting to be aired, I’m glad that Fraude graciously agreed to demonstrate his cooking and let me taste some of his food. “I’ve never cut myself before,” said Fraude with a smug smile as he wielded the knife with precision to slice the cucumbers for stir-frying with dried shrimps and garlic. Using his touch and feel senses, Fraude put dried shrimps and garlic pips into the mortar and pounded them with the pestle. I watched with fascination as Fraude washed and measured out the lengths of brinjals and ladies fingers and deftly cut them into equal lengths to add into the Fish Curry simmering in the pot. He listens to the sizzle and pop and smells the fragrance of the sautéed ingredients to ascertain how well cooked the food is as he moves the pots and pans around the stove and sink with an amazing skill by literally cooking in the dark. As we sit down to enjoy a sumptuous lunch of some of Fraude’s favourites, I’m deeply humbled because he has proven beyond a doubt that his sightless eyes, is no disability. My respect for Fraude grew with every bite of his fiery Devil Curry, Fish Curry, Masala Mashed Potatoes, Egg Omelet, stir-fried Cucumber with dried shrimps and garlic, Stewed Chicken in black sauce and stir-fried Bean Sprouts with salted fish. His determination to live more independently and contribute actively to the well-being of his family, is truly an inspiration. As Rebecca helped to serve at the table and Man Chen tidied up the kitchen, I can sense their unspoken pride in Fraude. One of the earliest stories I shared in My Johor Stories was, Going back to Masai-chusettes, with memories of Masai, the district where my parents were transferred for their work with the Government Health Centre. This was way back when Johor Port was yet to be developed and Pasir Gudang was just kampung Pasir Gudang with a beautiful sandy beach where I learnt to swim. At that time, Masai was like a “cow-boy town” with just one main road that was bordered by ramshackle shophouses. My sisters and I used to commute to school by school van and we travelled almost 26 km or 16 miles each way on the old road between Johor Baru and Masai. I remember our driver, Ah Tek, and his family also ran a coffeeshop in Masai and on our drive back from school, he often stopped at a supplier in Pandan to collect trays of steamed pau to ferry back to their shop in Masai. I will never forget the mouth-watering aroma that filled the van and how my stomach growled as I fantasized about sinking my teeth into those freshly steamed pau! Later when we were in secondary school, we often stayed back for extra-curricular activities and it made more sense if we took the public bus instead of the school van. In those days, there was no bus terminal in Masai and so at night after the last trip back to Masai, the driver would park the bus on the grassy verge at Jalan Sekolah by the Post Office. Sometimes the driver of this Alec Bus No. 39 may forget to shut the windows and when we boarded the bus in the semi-darkness early the next morning, we would be accosted by swarms of mosquitoes that had come to hide inside the bus! Jalan Sekolah was also the road that led to the Pusat Kesihatan Kechil or Health Sub-Centre where my parents used to work. In my story, My mum the midwife, I shared some of my mum’s adventures as a midwife among the families who lived in and around Masai, as well as in the nearby estates and Felda settlements. While my mum was allocated a terrace unit of staff quarters in the health centre compound, my dad – the Hospital Assistant or “doctor” and dresser – was assigned a single storey bungalow. Mum however, never occupied her quarters because as family, we stayed in dad’s bungalow next to the health centre. My parents were based in Masai for 13 years and as they became part of the local community, my siblings and I were fondly referred to as anak mee-see, mee-see or missy being the local phrase for nurse. The house next to ours was a semi-detached unit with each unit occupied by the families of the Assistant Nurse and the Staff Nurse. My parents enjoy gardening and they used to spend a lot of time weeding and tending to the flower beds around our bungalow and next to the Health Centre. At one time, dad started growing vegetables and the grassy space between the health centre and our bungalow was their vegetable patch, neatly cultivated with cabbages, chillie, eggplant or brinjals and ladies fingers plants. I shared this in Green Fingers, my story about my parents and their organic farming experience in our own little garden in Masai. When my younger brother was old enough to go to school, my parents decided that it was better for us, school-going children, to live with our grandparents rather than spend time in the daily commute. Our Ah Kong or grandfather’s house was at Jalan Ngee Heng, just walking distance to our schools, a most convenient location particularly for my brother who went to St Joseph School. During this period, our term holidays were always extra special because we spent them in Masai. My siblings and I visited Masai recently and we saw that it is no longer a one-road town but has a network of roads and lanes with new blocks of buildings and a much wider main road. The Chinese temple is a familiar landmark but there is now a bus terminal and the town was teeming with cars and pedestrians. I asked my brother to drive around to have a look at our former home next to the health centre and he drove up the back road from the town. When I saw the doctor’s quarters – last occupied by Dr John Daniel when mum and dad were still based there – with an overgrown garden, I suspected that things have drastically changed. The two rows of terraced staff quarters have been renovated but they were all shut and there was nobody around. Then when we rounded the bend to drive up the slope where the garage was situated next to the Health Centre, we realised that the whole compound was abandoned! The gates of the health centre were thrown wide open and the building, with its doors removed, seemed forlorn and plants were even growing inside. While the dilapidated interior is typical of an abandoned building, a section looked bright and I guessed that it was because the roof was broken and natural light was pouring in. It was a sorry sight, especially as the banner with the barely visible words, Di larang masuk, was also torn and fraying – and I wondered how long have this place been left to rot and fall apart! I figured that the Government Health Centre has been rebuilt at another site but it was sad to see how the entire compound here had been carelessly abandoned. The roof of our former home have been changed and it looked like it was recently painted, and it made me wonder if there are plans to use those buildings again but the wide open gates are an invitation for intruders to get up to some mischief in Government property. As we left the site, I was filled with sadness for the sorry state of this place that we once called home and where we made many fond memories. Angela, my friend from Asia Medevac Services (AMS) called me one evening recently to ask if I can join them to meet a patient who was going back to the hospital for his first check-up. I was rather puzzled until she clarified that his was a rare case where the patient had a dangerous lung condition and was literally brought back from the brink of death with ECMO support. I listened carefully to ascertain if this was a newsworthy item while I mentally checked my calendar to see if I could avail myself for this. As I began to understand what Angela was saying, I felt that I should cancel anything lined up to go with her to meet with the patient and his doctors. I guess our neighbours who observed an ambulance arriving at our house were curious but must have been surprised that I took time to snap photos and then climb in at the front passenger seat! My ride to the office was in an AMS ambulance! The driver and I had a nice chit-chat about his work while he sent me to the AMS office located at the lobby level of Tropical Inn JB where I met Angela and she drove us to the hospital. When we arrived, it was already close to lunch time and she told me we were going to eat soon. The patient, Tan Ban Gun, 59, with his wife and son were in the lobby, waiting for Dr Su Jang Wen, the thoracic & cardiovascular surgery specialist, who would be joining us for lunch. On our drive, Angela filled me in on the details about Tan’s case and how he had a miraculous recovery after a 21-day stay in hospital. By the time we meet, Tan would have completed his first check-up with Dr Su and after lunch, Tan would go to for his check-up with Dr Kenneth Chan, the respiratory physician & ICU specialist. Our time together would give me the opportunity to meet both the doctors who looked after Tan and interview Tan and his family members. When I was introduced to Tan, he was understandably bursting to tell me about how his dramatic medical experience had given him a new perspective of life. As his wife looked on with loving indulgence, Tan spoke to me enthusiastically in a mixture of English and Mandarin, while his son chipped in to clarify what his father was trying to tell me. We continued our chat over lunch and even though it was a sumptuous meal, I must admit that I could hardly eat because I was getting a whole lot of info from the doctor as well as Tan and his family. About one and a half months after I returned from a trip to China, I was the only member of our group to start having cough and flu symptoms. I have never been hospitalised in my life but this was the start of a dramatic medical adventure that led to my 21-day stay in hospital. At first, I consulted a clinic doctor as an outpatient but after taking his prescription, my cough and flu symptoms still persisted so I went to consult another doctor but even after I took the second prescription, the symptoms still did not cease. I consulted the third doctor, explained that I did not improve even after two courses of medicine and he suggested taking a chest X-Ray. From the X-ray, he suspected a viral infection and advised me to get admitted for treatment in a hospital. On admission, I was placed in the normal ward but my condition rapidly deteriorated and the next morning, I was put in the Intensive Care Unit (ICU). I had difficulty in breathing and was told that I had contracted pneumonia, a condition which caused my lungs to be almost completely filled with fluid. Efforts to help me breathe through a ventilator only made matters worse and I was deteriorating so rapidly that I later learnt that my wife, who was with me, was so shocked that she fainted. She and my eldest son were afraid that they were going to lose me and sought the help of the doctors to give me a chance to survive. They realised that part of the problem was that the ventilator was exerting a positive pressure on the lungs to force air in and this was increasing the inflammatory response. When my family reached a decision to transfer me to another hospital, the doctors contacted the Parkway Patient Assistance Centre in JB who initiated an emergency response from Asia Medevac Services (AMS), an organisation who provides bed-to-bed transfer services in this region, and made the necessary arrangements for me to be moved. Later my son told me that the doctors from the discharging and receiving hospitals spoke to him about my delicate condition but my son was determined to do everything possible to save me. At that point, I had only 13 per cent of lung capacity left but my family was prepared to take the risk and shift me to better medical facilities if it means that I would have a chance to live. Meanwhile Dr Su Jang Wen, a thoracic and cardiovascular specialist and his team at the receiving hospital were preparing the ICU room with all the necessary support equipment for me while AMS rushed me over in about 30 minutes through an emergency transfer. On arrival, I was immediately hooked up to the Extracorporeal Membrane Oxygenation (ECMO) support, a process that drew blood while adding oxygen and removing carbon dioxide before pumping it back, to allow my lungs to rest and recover. While I was on ECMO support for five days, I was also constantly monitored by Dr Kenneth Chan, a respiratory physician & ICU specialist, who made sure I was safe and comfortable. When my breathing stablised, I gradually recovered and stayed in the hospital for another 16 days. No one would have imagined that I almost lost my life because of flu symptoms but later, tests showed that my condition was caused by the H1N1 flu virus. At a recent check-up appointment at the hospital, the doctors found that I had lost 10kg and now weigh only 80kg. I used to have borderline high blood pressure but now I am normal and I feel like a new man! My doctors explained that ECMO treatment was originally used by surgeons for heart and lung surgeries but now the equipment has been simplified and the technology was transferred for use in the ICU. I’m ever grateful to the partnership of Dr Su and Dr Chan, working as a team for ECMO treatments for almost 5 years, and how they did everything possible to ensure my survival. I’m also thankful to the efficiency of AMS, the first of its kind bed-to-bed transfer services based in JB for patients in this region, for without their support, I may not be here today. I am from Pontian and I met my wife, who is from Segamat, while we were in Singapore and we settled down in JB. We have three sons, the eldest aged 32, and we have been operating a small business as a gas cylinder distributor in Mt Austin for more than 20 years. As an entrepreneur, I have been pushing myself relentlessly all these years but since recovering from this life-threatening experience, I’m looking at life differently now. I must have been at Death’s door but now that I’ve been given a new lease in life, the next chapter of my life will certainly be more meaningful. I have learnt that life is indeed priceless and now that I have been reborn, I’m not driving myself so hard but am going at a much slower pace, taking walks in the park, getting in touch with Nature and enjoying my family life. More importantly, now I can look forward to seeing my sons get married.